Just wondering….why are the pics at the main page of this topic still the ones from the dinner at the seaside nipa hut ? Pity we did not get to visit Culion when we were in Coron a couple of years back. sonny sj, sorry, technical glitch, fixed it… thanks. 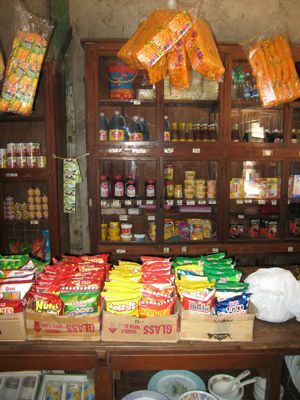 The cabinet in the last photo reminds me of the one in the old neighborhood sari-sari store when i was a young boy in Catanduanes decades ago. 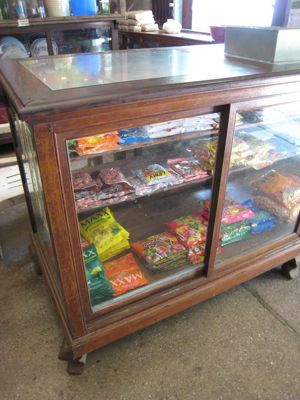 The store owner would place a milk or a flat sardine cans filled with cooking oil on each of the legs of the cabinet to prevent ants from eating the displayed edible goods inside. There is an old store in Hawaii that looks just like that. It is on the Island of Oahu, on the North Shore town of Haleiwa. Now I know why I always stop at that store when I visit my grandkids. 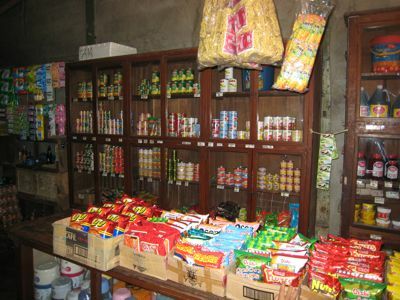 The place just flat reminds me of my youth and Ong’s Sari-Sari store. Really refreshing in this age of Tiangge’s and MegaMalls. That’s not very surprising. 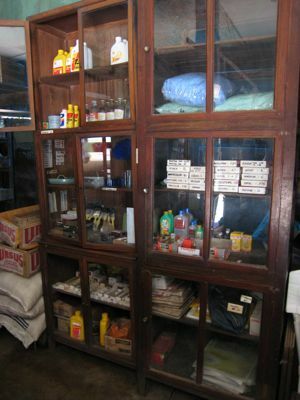 Many stores in the small towns of Negros still have wood cabinets like the ones in your picture. I am just not sure if the wood is narra but we see plenty of these in my province. I don’t mean to “hog” your website MM but please let me get an issue off my chest. inspired dishes. Prepared by Keller wannabees dressed in their impeccable whites, the food was certainly good enough but the ambiance was bourgois. eat. I wanted to be in the ‘hood. super consumers like big city folks with over burdened charge cards? Have they become snobs? I certainly hope not. Thanks for indulging my minor rant and I promise I will try not to let it happen again. All I could say the narra display cabinets will outlive the store! Silly Lolo, I’d love to meet and hang out with you for a day :) I understand from your previous posts, you’re also in the Bay Area. You seem to be the hippest and coolest Lolo around here. I always enjoy your rants and raves. we have the same “eskaparate” in our store in the province, we even have the old sign of my great grandaunt’s botica Farmacia Admana and medicines in bottles hidden by the grime and dust, an old ad of Vote Antonino for senator in lawanit, i wish i could preserve those, it takes money to do that. Aww shucks EEJ and Betty Q, you guys are too good! Beware, my daughter will always tell you, “Don’t encourage the little guy. He gets OUTTA CONTROL”! Ooops, there I go hoggin’ it again. Sorry Mr. MM sir! SillyLolo, if you want a taste of “carinderia food, just follow Makati office workers at lunchtime… They know where to get satisfying local food everyday. Their patronage is the best measure of cleanliness and your money’s worth. Some say those semi-permanent JolliJeeps are okay too, but unless you know someone who can vouch for a particular JolliJeep, I would steer clear. Hi Silly Lolo! Let me first say I do enjoy reading your comments! You’re such a hip Lolol. Wish I had a Lolo like you! I’d like to put the advise you’ve received about Carinderia & restaurant eating in Manila and issues about safety into perspective by telling you about my experience as a balikbayan visiting home. In the last 4 years, I’ve gone back home about 8 times. Out of those 8 times, I’ve had food poisoning 4 times. I’ve missed appointments, had work schedules messed up, and missed flights (I had to re-book a few hrs before I was supposed to fly) because of these episodes. In 2 instances I’ve had to lie in bed for 2 days and was weak for another 4. My most recent episode was Nov 2007. I’ve had them because of badly cooked home food (thankfully someone else’s home & not ours), water, and restaurant food (as in we ate at a restaurant & not eat take-out). I was most surprised about getting food poisoning eating restaurant food until an aunt explained to me that when restaurant sales are not brisk enough, the ingredients are kept too long and some pieces start to spoil. She told me the safe bet is to go to the “In” places since all their brisk traffic will mean fresh ingredients. And since fusion cooking is in… well, that’s where we will get pointed to. Nowadays, I pack Bactrim in my travelling first aid kit and I eat more fresh fruits when I’m in Manila. I look at the banana que, kamote que, BBQ on the street and just droooooolll. Like you I love Mais con hielo, but I don’t know where I can go and eat “safe”. So while I dream of things to eat back home, the actual eating is an agonizing thought for me. 4 food poisoning episodes taught me a lot.. The short of what I’m saying is … the people giving you advise are not being snobs. They’re just being careful. Silly Lolo, i hear you! while i do enjoy going to upmarket-ish places, i miss having a serve of lumpia or bihon in old-style shops in, say, ongpin. they are few and far between these days. last time i was home, i noticed that ice cream vendors and buko sellers are so rare… where can i get dirty ice cream??? I was also told that it’s the tap water and the ice that makes you sick. So you can eat anything that is cooked anywhere as long as you don’t drink the tap water they serve, always drink cold bottled water without ice, or better yet just drink softdrink or straight from the can. it’s weird how we often overlooked at these precious pieces. luckily, we still some similar cabinets at my lola’s house. i’ve gone back to visit 4 times since 03 and have not had the same problems you went through and I feel sorry about your sad experiences. I’m much careful at times as to where and what to eat, but in most cases I just eat whenever I get hungry, wherever I might be. I tried all sorts of street food, big and small restos, even a couple of carinderias inside a public market in marikina and nasugbu in batangas. Maybe my system simply has higher tolerance for “bad” food, or the excessive amount of alcohol from my previous night’s escapades killed all the germs before they can do any damage. Dennis, I was rolling in laughter upon reading your “alcohol” comment. Maybe I need that too! On the other hand, I think I have that darn bad-luck balat in my underside!! Come to think of it, Filipinos patronize carenderias, fastfoods, and other “street foods” everyday…in millions! I rarely heard them complain. Dee bee: Best buko place I found was at the far end of Market Market. I once sat there and killed 5 buko, one after the other. Tino, the buko guy, sells buko with ice cream, with sago & gulaman, and with halo-halo. Just plain for me. I just want to get at that slimy, juicy, sensous meat! By the way, what’s dirty ice-cream? Is that dirty as in X rated? Is it some sort of love potion masquerading as ice-cream? Is it performance enhancing? Tell me, please! I am very interested. Silly Lolo, you are indeed silly funny! It is the generic ice cream sold by the local sorbetero pushing their ice cream carts – in other words not the branded Magnolia or Selecta brand. I stopped eating those only after someone told me that the sorbeteros don’t wash their hands after they made wee wee in a corner nor after they handled money, then go right on scooping ice cream into the cones . Hence the name dirty ice cream. But boy I loved those as a kid, my favorite was the maiz con queso. Going back to the cabinets, those are lovely, they remind me of the built-in bookshelves we had in our school in the 70’s which housed the precious sets of encyclopedias. Silly Lolo, i have a theory why balikbayans stay away from carinderias that we “iwanbayans” patronize: your systems have been so used to “clean” food unlike ours that have evolved to be able to digest and neutralize most of the peskiest microbes that linger in food! Kumbaga, our systems are already somewhat disensitized to microbes (at least to most of them! )so it’s harder for us to get hit with the “runs”! But if you are a brave soul, there are several excellent carinderias in Ongpin, F. Torres (Ambos Mundos and Wah Sun) and even in Dian, Makati (Sosing’s) patronizedby laboere and office workers alike. Sarap!!!! Great observation, Cecil J. Probably the same reason Mexicans never get Montezuma’s revenge and everybody else does! Speaking of reasons: The reason I like to go back to Manila rather than anywhere else is because of you “iwanbayans” (love the word). I don’t go back to meet Balikbayans who seem to have developed “the attitude”, they waste my time. I once bought a Sampaguita garland from a street boy and when I asked how life was for him, he said, “Ok lang sir. I make a bit of money and we can eat and we are OK lang”. He wasn’t downtrodden, there was no hopelessness, he didn’t say “Pity me”. He was brave, he would do the best he can which is OK lang. And then he said “Here, let me pick the best one for you”. He gave me a “sales” job! He made me feel good about buying from him. You gotta love that spirit. I bet he’s doing better than OK lang by now. I’ll be back with the iwanbayans soon and for a long time this time. Trust me, I’m missing you. I loved reading the little snippet of things happenings back home. I was back only once in 1992, I have never found the time to go again (esp. with my husband and kids (2 girls). About the narra display cases, they were wonderful. For a while now I have been obsessing with another narra creation. the capiz window panes. i think i have about 7 panels of them, and i don;t know what to do with them too. i have a wood carver friend that i asked to make something out of them, but he wanted to cut them to pieces. i felt like he would be cutting me to pieces to. so these beauties are just standing straight out along my walls. smiling at me. Raine, about the capiz window panes, you can jazz them up and make them into znaazy, one-of-a kind dividers or bed headboards or put colored glass over one of the panels as well as legs and you’ll have nice coffee or buffet table! Thank you, Dodi for your advice. Our friend is making a door out of these panes and I am using your idea as head board for the remaining ones, Thank you. Silly Lolo..I agree with Cecile re your stomach system sanitized by clean germs there…hahahaha…but you’re so funny…and silly. Where were you when the dirty ice cream carts rolled the streets…..you;re a cool lolo…..
See,we iwanbayans can eat anywhere and not get sick…hahahaha..
Leche Flan, Bibingka, Ube Haleya, Ensaimada, atbp.!! !